Struggling to find the perfect present? Need an emergency last minute gift? Well let TruffleShuffle come to your rescue with our handy E-vouchers which allow the lucky recipient to choose their own pefect present from our huge range of fantastic tees, accessories and gifts! Choose your voucher and who it is for. Simply choose whether you want to e-mail the E-Voucher to yourself - this way you can either print the gift voucher to put in a card or you can forward the email to your friend yourself. Or alternatively, we can email the E-Voucher straight to your friend along with your personal message on whichever date you choose. Easy Peasy! Please Note: TruffleShuffle Gift Vouchers are sold subject to these Terms and Conditions. Chunk, you lucky thing! 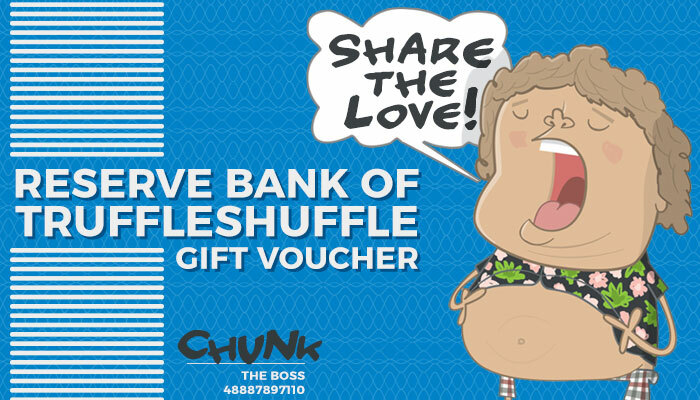 Your friend Sloth has sent you a TruffleShuffle.com gift voucher!! Take extra special care of this code - you'll need it to use your voucher. To avoid anyone other than yourself using this voucher, log-on and associate it with your account - all the how to details can be found in our Help & Contact Section.